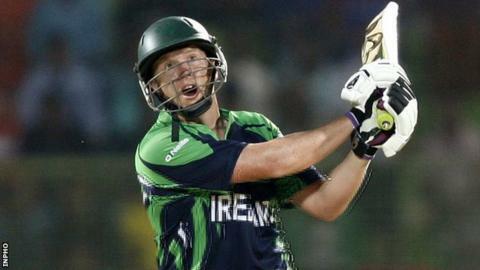 Ireland lost by three wickets against Northern Districts in the first of four tour games in New Zealand. Kevin O'Brien top-scored with 45 in a poor Irish battling display at Seddon Park in Hamilton and the tourists were all out for 153 in 40.4 overs. George Dockrell picked up four wickets but it was not enough to prevent Northern Districts from reaching 157-7 with almost 12 overs to spare. Ireland face a New Zealand XI at the same venue on Saturday. The World Cup warm-up tour started in Australia with two defeats by Queensland Bulls followed by two victories over ACT Comets. The Irish were in early trouble in Hamilton, Andy Balbirnie and Andrew Poynter dismissed with just four runs on the board. Niall O'Brien (21) and his brother Kevin were the only Ireland batsmen in the top six to get to double figures as they were reduced to 58-5. Alex Cusack (20) and Dockrell (28) chipped in with valuable lower-order runs but a total of 153 made the hosts firm favourites. Northern Districts were 19-2 before Joe Carter (42) and Daryl Mitchell (39) steadied the innings and the target was reached in 38.1 overs. Dockrell was the pick of the Irish bowlers with 4-17 while Craig Young, Graeme McCarter and Peter Chase each took a wicket.